Info: ‘στην άκρη του βατήρα’, Μπαγκλαντές, Chalkokondyli 35, Athens. For French philosopher, Jacques Rancière, theatre is not only a form of communication in and of itself but also a form of potential emancipation where artists do away with instructional intent or the wish to convey a message to an audience and seek instead to embody a living community and produce an intensity of feeling, energy of action or in other words, a form of consciousness (Rancière, 2009, p. 15). 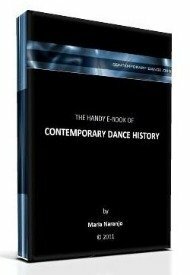 This is also the case for contemporary dance art each time the audience is transformed from a collection of distant spectators of represented action to a community of presences that enter into a relational paradigm with the performer(s). In other words, the power of contemporary dance form lies in its current multiplicity that remains open to other art forms transforming dance performance into a spectacle without spectators and placing bodies in action and interaction with other bodies that are to be mobilized. The dance art performance ‘Στην άκρη του βατήρα’ (On the springboard’s edge), the outcome of the conceptualizations of the choreographer Maria Gorgia in close collaboration with the dance performer Sania Strimbakou, is one of those significant moments of contemporary dance art that achieves a direct, immersive relationship between the performer - and the choreographer through her - and the spectators reformed in the coures of the piece as a community of presences. The choreographer and performer do not seek to seduce spectators into a staged illusion of realities but rather provide them with an immediate, hence authentic reworking of the ordinary that allows those present to connect with what happens in front of them at a profoundly experiential level. The act of performative connection becomes thus endowed with transformative potential for one’s conception of their own self and their everyday relationship to the social world. The performance is set in the bare basement of a block of flats in the street of Chalkokondyli, in the heart of the city centre of Athens. The space in question used to function as a community centre of Bangladeshi residents of the inner centre of Athens and is now a vibrant creative space, known as Μπαγκλαντές, set up by a group of young artists, Vaso Kamaratou, Kostas Koutsoulelos, and Vassilis Noulas. that is often described in mainstream media as a ‘degraded’ region, far removed from the ‘painless centre ... where prostitution meets addiction and despair at night’ (Kathimerini, 2014). In that broader context of urban crisis, Strimbakou, a highly skilled and ebullient performer, lays bare the personal and existential crisis of a/the/that contemporary woman and turns it into a mirror of life’s hedges at the edges of time. The piece draws its power from its playful character, its fluidity and constant switches from one role and identity to another. Its special focus on the fragmented multiplicity of (un)being and (un)becoming a ‘female’ person(a) reveals the bewildering contradictions of contemporary consumerist and consuming society where selves undergo erasure in the process of becoming spectacularized. The audience gets immersed into the multi-level piece as active participants by aligning or disaligning themselves with the everyday crises in which the staged personas engulf themselves and by engaging in reflective action on questions that invite an in-depth and honest exploration of self: who are you? who is the other? where is the other? do you see you? do you see the other? do you feel? what do you feel? what are you? The authenticity in performance emanates from the spectator’s willingness to relate to the staged expressions, body movements and voices, a mélange of the words and experiential fragments from Beckett, Miller, Gorgia and Strimbakou. The mosaic of voices becomes a social canvass airing the tensions of a life consumed in non-stop technologically mediated sociability where the self becomes a phantasmatic entity stretched to its limits. The different levels of self-crafting, self-staging, and self-doubting embodied in and through the performer’s multiplied presences are communicated effectively as they open up an array of meanings that move beyond the fixed symbolism of mere representation of ideas. In the echoes of the staged imagined relationships, desires and dilemmas, worry and fear in their many guises are projected as the raw matter of feeling that are biting away everyday, lived thoughts and time. Φοβάμαι…. (I am worrying). Worrying about expectations, the present, the future, about what I can do, what I want to do, and what I desire; and at the same time, φοβάμαι... (I feel threatened), I engender a fundamental fear of my self, fear of the other, fear of proximity, fear of betrayal, fear of relating to the other, fear of life. 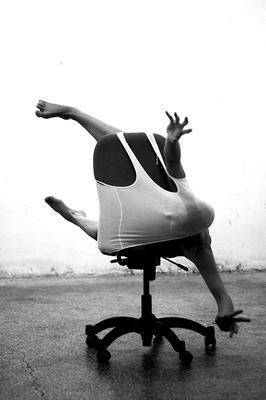 The swivel chair becomes the vehicle for playing with and outplaying worries and fears at the edge of desire; hiding, merging, jumping on and off it, regaining balance between incessant movement and stillness or leading into new forays of action across the four ends of the bare wall, a thrust forward in the inescapable game of life and death. Throughout this demanding, immersive solo performance, the dance artist’s skilled transformations and invested presences brought to life Gorgia’s powerfully conceptualised piece, immersing the audience members in a participative spectacle of everyday affects and inviting those present to reflect on our own and others’ place in social time and space. Rancière, J. (2009) The emancipated spectator. London: Verso.